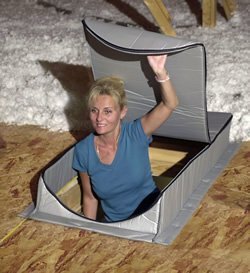 The Attic Tent is the ultimate attic access insulation cover ever invented attic stairs scuttle holes knee-wall doors and full-size doors. Its primary design is to stop air infiltration between the home and attic the most common medium for wasting costly residential energy during both hot and cold seasons. The HVAC systems in homes are designed for a closed envelope making air balancing with supply and return air very critical. Every time these systems are operating they create e a positive or negative pressure thus forcing conditioned air out or drawing outside air in the home. It also keeps out unhealthy insulation and dust particles from the attic.Features. The Attic Tent is a specially engineered patented insulator designed to create an air transfer barrier between your attic and living areas.. Main Materials-Nylon Fabric and Polyurethane Form Flame Retardant AT-2. 2 in. mounting Flange Used for fold down attic stairs scuttle Holes and Knee wall doors. Dimension - 54 x 25 x 7 in. Dimension - 54 x 25 x 7 in. If you have any questions about this product by InsulSure, contact us by completing and submitting the form below. If you are looking for a specif part number, please include it with your message.